Video Recipe - Any food that jiggles is always fun, and desserts are fun. 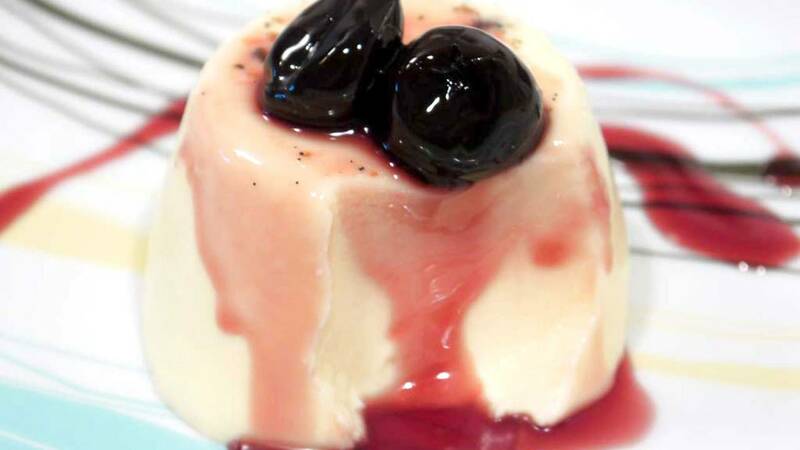 So the funny and delicious Panna Cotta is the ideal dessert. It is easy to make, it tastes good and it is so neutral that it will fit onto a dessert plate with almost any other accessory. It is not without reason, that it is a classic. Let the gelatin soak in plenty of cold water. Scrape the seeds out of the vanilla pod. Peel the zest of 1 lemon with a vegetable peeler or a sharp knife. Get as little of the white layer as possible as it is very bitter. Only the yellow layer taste good. Mix all ingredients together in small saucepan and bring them to a simmer while stirring. Take it off the heat and let it cool a little. Then and pour it into a cool bowl. If it stays in the pot it will be kept warm for longer and you risk burning a the cream in the bottom. Twist the gelatin leaves free of water and put them into the hot mixture. Allow the mixture to cool to about room temperature. If it is a bit viscous, it is best. Then all the vanilla seeds will not sink to the bottom of the molds. Pour the mixture, except lemon peel into 6 molds. A little more than 1 dl (about ½ cup) per mold. Put them in the fridge for at least 4 hours. Preferably for longer. Just before serving you fill up a bowl with hot tap water. Dip the molds into the bowl for 5-10 seconds. Depending on the shape and thickness. Metal molds should only be dipped for a short time, coffee cups for a long time. This melts the gelatin slightly so they can slide out. Loosen the edges with your fingers to see if they loosen. If not then put them back into the hot water. Try shaking each mold to see if it will loosen. When it does then put two fingers in the bottom of the dessert and slide it gently out of the mold. They are easily broken! Stir the vanilla seeds as much as possible. Preferably use a whisk. In the video I use a scraper. It is not too good. Stupid me! The classic recipe is without zest and white chocolate. I am definitely in favor of the lemon peel. It can lift the flavour significantly. The white chocolate gives it a slight licorice flavor that is also really good.